One of my favorite things to do is go to the farmers market weekly. If you know of a farmers market in your area I recommend you go to it and support our local farmers and vendors! This week I found two very unique ingredients to experiment with- lemon cucumbers and wine berries. 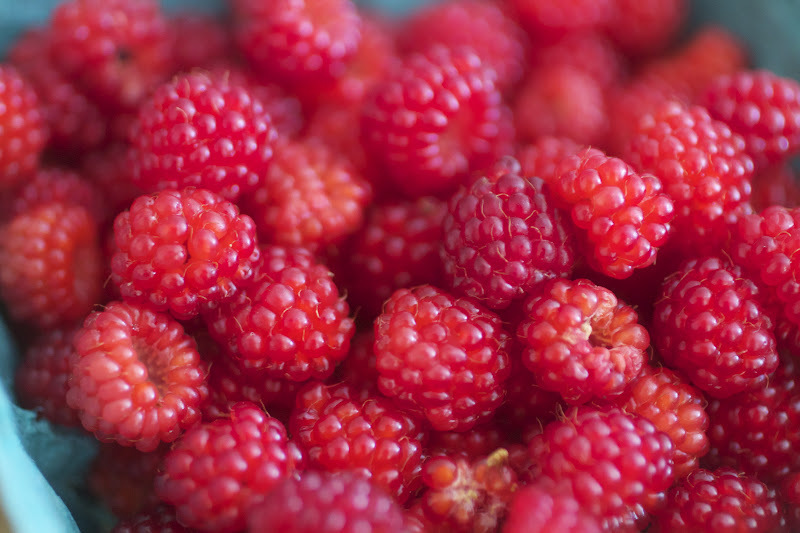 Although the wine berries look like a miniature raspberry, they have more of an unique flavor profile. 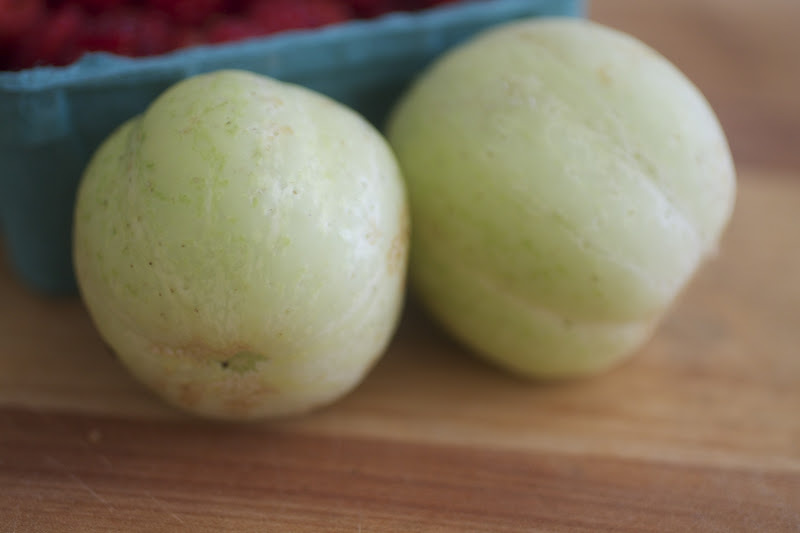 The lemon cucumbers were explained to me as cucumbers that have a lemony taste; however, although they are different then the run of the mill cucumber they don't have a bursting lemon flavor. 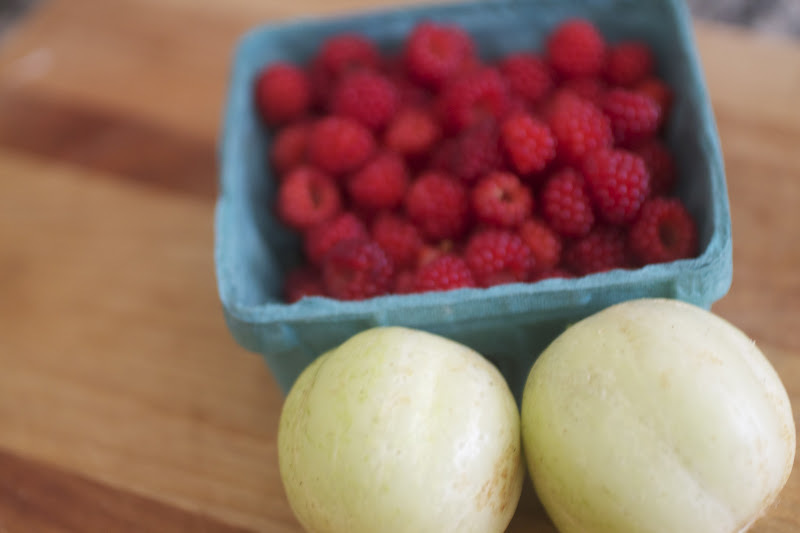 Both of these ingredients are refreshing, summery, good for you and best of all local! So with such fresh ingredients what is a girl to do with them but cook with them? Here is what I did with each one! In an effort not to waste the 12 beautiful egg yolks left from my Toasted Coconut Angel Food Cake with Cream Cheese Frosting, I made this Zabaione. 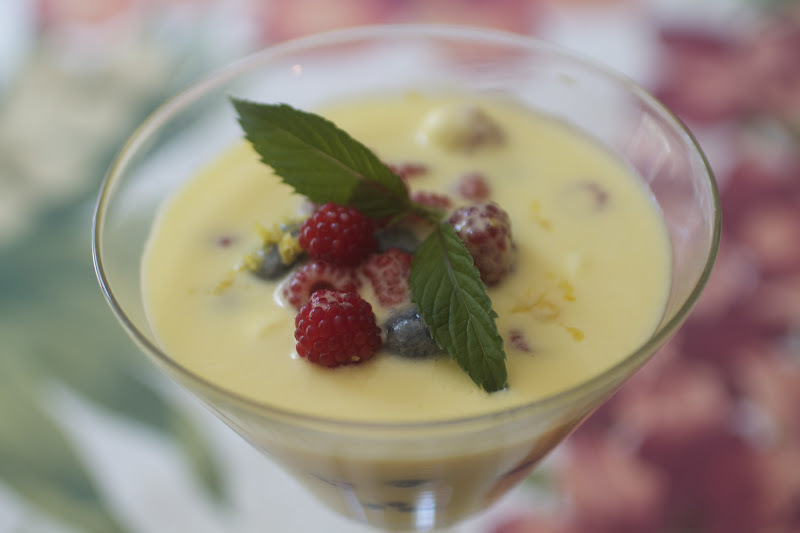 Zabaiones are a great way to use up extra egg yolks. 12 yolks will make a lot so cut it down if you would like. You can also use any type of liquor or fruit so get creative! Put the egg yolks in a glass bowl. Whisk in the sugar, lemon zest, white wine and limoncello. Bring water to a boil in a saucepan. Lower the heat and place the bowl over but not touching the water. Constantly whisk the mixture for 16 minutes, or until it becomes fluffy, thickened and creamy. Constantly monitor the heat, so that you do not end up with scrambled eggs. Take off of the heat and transfer the yolk mixture to another bowl to allow it to cool. In an electric mixer bowl, whip the cream. With a rubber spatula, fold the zabaione and the whipped cream together. In separate martini glasses place blackberries at the bottom followed by the blueberries and wine berries. Top with with Zabaione until all the berries are covered. Top with a sprig of mint, lemon zest and two wine berries. Chill in the fridge for at least 40 mins or until ready to serve. Enjoy! 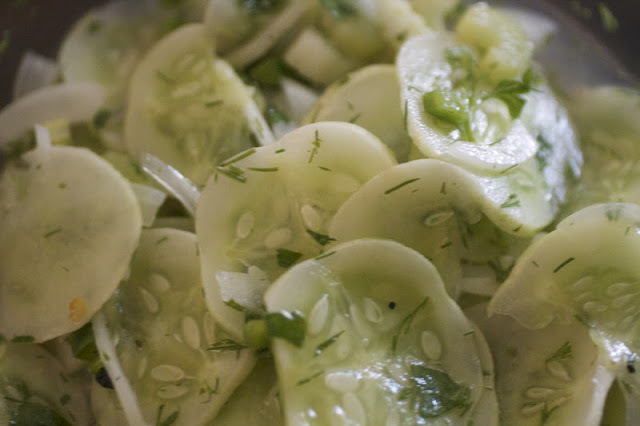 After a recent visit to Momofuku Noodle Bar in NYC I felt pretty inspired to make some pickles of my own. Here is how I made my version of them. Mix all the ingredients together and let it rest before serving. If you want to chill them put them in the fridge. This entry was posted in Little Bites,Recipe,Sweet Tooth by Catherine Amoriggi. Bookmark the permalink.